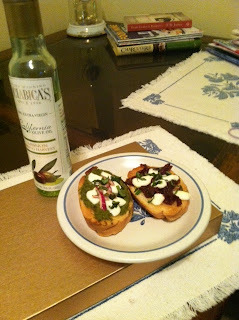 For the olive oil challenge I decided to make bruschetta! Three different kinds! I made a homemade pesto and paired that with mozzarella and red onion, a tomato and basil salad for another, and finally a sun dried tomato and mozzarella. I don’t usually use any sort of recipe to make pesto, so I’m just going to wing it here. Also, I usually use walnuts in place of pine nuts. They’re cheaper and I always have walnuts in my freezer. I love to make tomato salad. You can use any kind of tomatoes, but I used cherry this time. I try to grow tomatoes every year, and for the past 2-3 summers I’ve grown cherry tomatoes. Let me tell you…I ate cherry tomatoes nearly every day for 3 months. 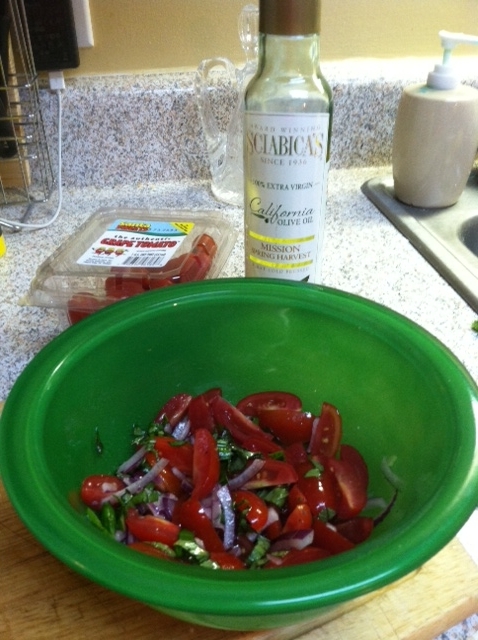 I would make my tomato salad at the beginning of the week and eat it with my lunch. Every day I would pick new tomatoes and just throw them in the bowl with the remaining salad. By Friday that stuff was GOLD. The longer it sits the better it is! Add all ingredients except olive oil to blender or food processor. Blend till a paste forms and start adding olive oil. Blend some more until a moist paste has formed. Voila! You just made pesto! It’s that easy. Mix all ingredients together and allow to chill for at least 15 minutes. Slice baguette into ¾” slices. Toast to golden brown. You can do this in a toaster oven, under a broiler or in a skillet. Place desired amount of pesto on toasted baguette and dot the top with pieces of the mozzarella. 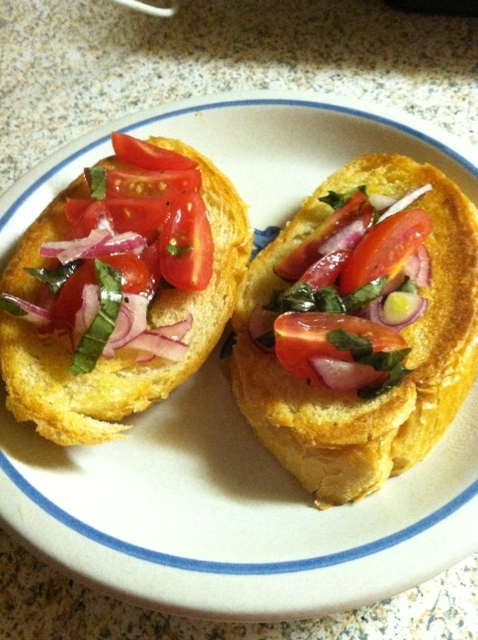 I used some of the marinated red onion in the tomato salad to garnish the pesto bruschetta and it was wonderful. For the tomato salad bruschetta, just spoon about 2 tablespoons of the salad on top the toasted bread and it’s done. For the sun dried tomato bruschetta, just spoon some sundried tomatoes on the toasted bread, dot with fresh mozzarella and garnish with a few chiffonades of fresh basil. The tomato salad bruschetta is meant to be eaten cold, but pop the others under a broiler to melt the cheese and enjoy!